"This book will make you cry, think, and then cry some more." Adam Silvera was born and raised in the Bronx. He has worked as a bookseller, as a consultant at a literary development company, as a reviewer of children’s and young adult novels. He is also the author of the highly acclaimed debut novel, More Happy Than Not, and the New York Times bestseller They Both Die at the End. He lives in New York City and is tall for no reason. "Adam Silvera is a master at capturing the infinite small heartbreaks of love and loss and grief. History Is All You Left Me is a beautiful meditation on what it means to survive devastating loss. This book will make you cry, think, and then cry some more." "A complex, touching valentine to love and friendship . . . [Silvera] gets the small details of love and loss exactly right. These moments are framed in exquisite prose . . . In this emotionally charged story, Griffin’s desire to be honest with himself and others leads the reader to a greater understanding of how it feels to have a conflicted heart." "Through Griffin, Silvera presents an eloquent, in-depth examination of 'whatever comes next,' of the ways in which the grieving process both isolates people and draws them together." "History Is All You Left Me overflows with tenderness and heartache. Even when its hero is screwing up royally, maybe especially then, Silvera's humanity and compassion carve out a space where it's not the falling that's important, it's how you pick yourself back up. There isn't a teenager alive who won't find their heart described perfectly on these pages." "Sweetly devastating, passionately honest, and breathtakingly human. Only Adam Silvera could have written this story." "The YA world has been taken by storm by Adam Silvera." "If you think Silvera’s debut novel More Happy Than Not was good, then you’re about to be blown away when History Is All You Left Me hits shelves . . . This novel does more than just bring light to the LGBTQ community, it helps bring mental health awareness into a world that desperately needs it." "Silvera’s wrenching sophomore effort . . . is not for the faint of heart . . . A love story for the ages." "A pain achingly realistic and emotional book about first loves, loss and what comes next." "Silvera delivers another twisty novel about self-exploration, adolescent relationships and the bond between first loves. History Is All You Left Me is a tale for today’s youth—one that embraces the essence of time and love." "Silvera packs a powerful emotional punch in this multilayered story told partly in flashbacks by Griffin, who's mourning the sudden death of his best friend and first love . . . The conversational yet profound tone of the book highlights the author's ear for the musicality of language and his ability to convey deep emotion through attention to its cadence and flow. A novel to savor long after it ends." "Though Griffin’s vision is clouded by grief, passion, and guilt, readers will have no trouble understanding how unmoored Griffin has become: Silvera excels at capturing the confusion and pain he feels . . . Griffin has much to puzzle out as he tries to move forward, but he does so with the reassurance that real love exists." "Silvera’s splendid sophomore novel is filled with tantalizing questions about lies and honesty, love and loss, and past and present . . . Beautifully realized, character-driven work of literary fiction . . . In those questions, they will find an unsparing honesty that brings closure to the novel and to Griffin’s quest to let go of the past and embrace the future." "Silvera offers a gem of a story about first love and great loss . . . Profound . . . It is so easy to idolize a first love, and even easier to idolize someone who has died. Griffin’s gradual awareness of Theo’s flaws is the true heart of this standout title." 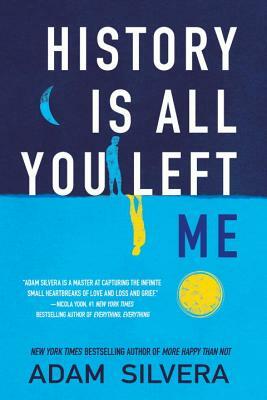 "Adam Silvera is wrenchingly good at writing about grief . . .History Is All You Left Me quietly shows how dealing with loss will help Griffin see himself and his world more clearly. It's a painful coming of age, but a beautifully written and very satisfying one." "Silvera’s prose is raw and lyrical, a good fit for Griffin’s intensity, and the minutiae of both romance and grief are closely observed and deeply felt . . . Griffin himself is an indelible character who will linger in readers’ sympathies after the last page isturned." "Silvera finds a depth in Griffin’s story that is remarkable . . . One of the best young authors dealing with issues like sexuality, depression, mental health, and the complex and often confusing relationship rules of Millennials and younger generations. He may be categorized as YA, but Silvera is a writer well worth reading no matter your age." "Grief is strong and realistically portrayed in this tale of relationships and love." “Beautiful . . . With a precision that feels at once dreamy and casually reportorial . . .
"Poignant . . . So engrossing that once you start it, you won't be able to put it down. Don't say we didn't warn you." "Heartfelt . . . The futuristic twist, with its poignant repercussions, drives home a memorable, thoroughly contemporary theme: who you are inside is not something that can or should be erased . . . Lose your memories, lose your pain, lose yourself." "A gut-wrenching story telling of race and sexuality." "[An] important addition to speculative fiction for young adults . . . Silvera's tale combines the best features of science fiction with social justice in this engaging read, as Aaron finds a place where he belongs." Soto, and his struggle to be who he really is. It confronts race and sexuality in a way I haven’t seen in the genre before."